Well I had big plans of sharing some things I have been working on yesterday, but my printer ran out of ink AGAIN (time for a new printer) so my orders have been put on hold until I can get to the store today. So, I thought I would share my to do list...some things that I would love to try. I have been drooling over this chocolate cake recipe since Martha introduced it back in 2006....some day I will make it! 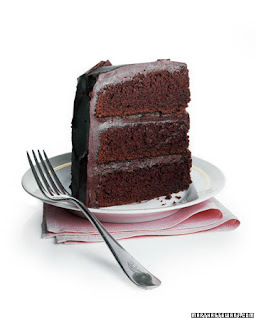 I love moist dense chocolate cakes with thick fudgy frosting...*sigh* I think I'm in love! Second, this cute idea to make candy necklace garland. This idea was sent to me by my friend, Chantelle (she is my official hunter and gatherer of all things fabulous). I can just see my kids eating away at the decorations like a flock of crows! So colorful and I am sure, very tasty! I bet you could string colored cereal as well and have the same look and probably less expensive. 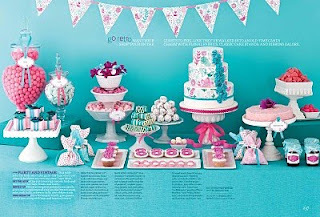 Third, I want to get some really cool Apothocary jars so that I can make a dessert table that is inspired by Amy Atlas. OH how I love Amy's work. 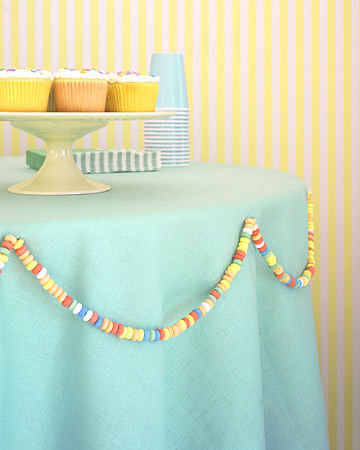 Wouldn't you love to be at a party where there was a set up like this! Almost too pretty to touch. Well I guess there is something I can share with you all. Our candy bar envelopes/wrappers. Oh how I love these favors! This is my latest design to go along with my lady bug themed cake. Hershey bars make a wonderful party favor or thank you for any age. Whether its for a shower or a kids birthday. Inexpensive and a great personal touch to your event. Well hopefully today there won't be anymore glitches and I will be able to finish up my orders that I need to get out. Two Alice cakes and 120 wedding favors! In case I haven't mentioned it before... I LOVE my job!